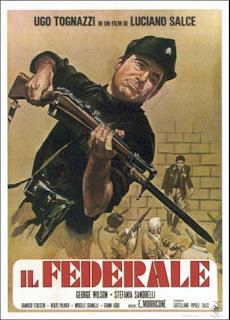 He could have gone on like that for who knows how long without the film that established him as a complete actor: IL FEDERALE (THE FEDERALIST), directed by Luciano Salce in 1961 and written by him with Castellano and Pipolo. In 1944, in Nazi-occupied Rome, Primo Arcovazzi is a modest non-com in the Black Brigades, a Fascist ingenuosly confident of the "certain victory," zealous and unquestionably a little stupid, who is given the assignment of going to the Abruzzi and arresting and bringing to Rome a distinguished anti-Fascist university professor whom the democrats plan upon making the President of The Republic, once Italy is liberated. Arcovazzi rides off in a motorcycle with sidecar, no automobile being available in those difficult times, and amidst endless vicissitudes returns with the prisoner. Except that the Allies have meanwhile reached Rome and Arcovazzi, who is traveling in a Mussolini black shirt, risks ending up in front of a firing squad; it is the professor who saves his life. The "gimmick" of the comedy is in bringing face to face two opposite mentalities, that of the dim-witted Fascist, who believes in all the slogans of the regime, and that of a liberal intellectual, wise and tolerant, who without ever pinning him to the wall, leads him little by little to understand certain things, to open his mind to a more responsible and critical evaluation of what is going on. In other words, a dialogue on the values of democracy and freedom, carried on in the midst of a hundred incidents and the risk of an active war. Though his partner was an illustrious name in the French cinema and theater like Georges Wilson, Tognazzi succeeded in emerging, drawing an exhilirating but penetrating portrait of his dull-headed Fascist. In 1962, Luciano Salce would again lead him into the terrain of comedy with LA VOGLIA MATTA (THE MAD DESIRE), based on a short story by Enrico La Stella. Tognazzi's Berlinghieri is a character that would also be found in other films, the middle-aged man who falls madly in love with a much younger girl. Scintillating and gay, the film contains sudden turns of bitterness: Berlinghieri and Francesca do not succeed in overcoming the difference in age and their affair comes to an abrupt end. Tognazzi's third important collaboration with Salce (and the script-writers Castellano and Pipolo) was in 1963 with LE ORE DELL'AMORE (THE HOURS OF LOVE), a pungent, ironical, analysis, with some dramatic moments, of the crisis of a couple after marriage has legalized a long affair: they will go back to loving each other only when they are no longer husband and wife (the same theme, viewed from a completely different angle, of Ingmar Bergman's SCENES OF A WEDDING).